New York, NY—February 13th, 2017 — What if your greatest ally was secretly your greatest enemy? What if the most trustworthy, stalwart hero history has ever known has been planning in secret a massive betrayal? That time is now. And you won’t be ready for…SECRET EMPIRE! 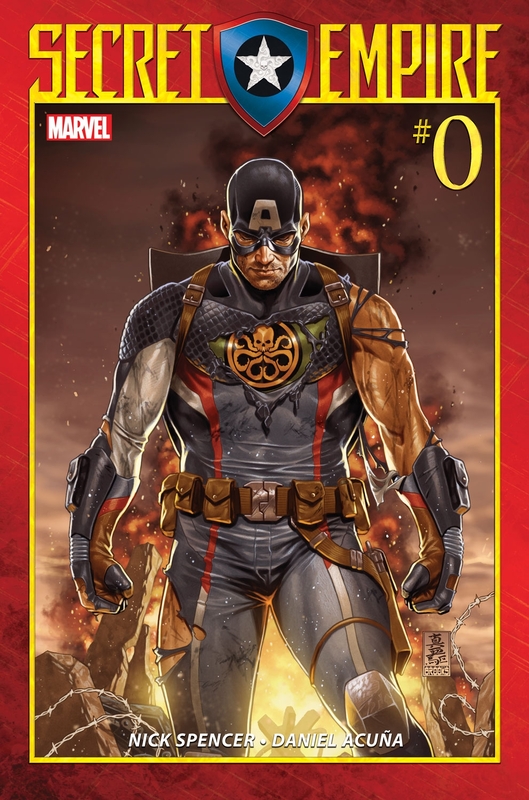 Before the premier comic launch of 2017, superstar creators Nick Spencer and Daniel Acuña toss the every hero of the Marvel Universe into a fiery crucible as Captain America’s master plan is cast into action with April’s SECRET EMPIRE #0! Now, the Avengers, the Champions, the Defenders, the Guardians of the Galaxy, the X-Men and more will be tested. As Hydra’s grip tightens around the Marvel Universe, the heroes stand at the precipice of an unprecedented challenge. How will they Marvel Universe cope with this shattering betrayal by the most trusted among them? The secret is out this April in SECRET EMPIRE #0!